Clean and reasonably priced, the location was good too, nice extras like an ironing board and fridge. The hardworking team here at Orbitz can't wait to help you bundle up your flights and hotels to save cash. Simply choose an option and get packing for the ultimate trip to Anaheim. An excellent way to save is to combine your bookings. Save up to $857* by picking out your desired hotels, rental cars, airfares and experiences with us. And there's more to come! With no less than 500,000 hotels worldwide and 500 airline partners, you've got the chance to choose exactly what you want. Get a package that fits with you and your own style. There are unlimited available room types, flight options and awesome experiences just a click or two away. Irritating forms, cards and paperwork — who needs that? We've developed an easy system. Just continue booking with us and you'll gain instant Orbucks! You'll be able to get your Orbitz Rewards points on your next booking. If you lock in four nights in a calendar year, you'll be a gold member; 12 nights gives you platinum membership. Perks, such as complimentary breakfast, at Orbitz Rewards VIP Hotels are accessible to all gold and platinum members. Few things put you in the mood for traveling more than researching your next destination. So, are you ready to learn a thing or two about Anaheim? This city is around 380 miles southeast of California's capital, Sacramento. Anaheim is also 4 miles south of Fullerton. It shouldn't be hard to make some new friends in this part of Orange County. It has a population of around 340,000 locals. Knott's Berry Farm and Disney California Adventure® Park deserve to be high on your sightseeing itinerary. You'd be crazy not to visit these extraordinary attractions! Anaheim features a number of terrific places to visit, such as the Medieval Times and the Discovery Science Center. Prefer something else? Well don't worry — you're flush with choice here. Some more options include Crystal Cathedral and the Bowers Museum. Prepare yourself for an action-packed day out at Disneyland®. Get your heart racing on one of the hair-raising rides and treat your taste buds to some delicious treats. Want to keep the good times rolling? Spend a few hours or more shopping at Downtown Disney® District where you'll be able to find the perfect gifts to take back home. But wait, that's not all there is! Even though this institution is renowned for its name as a prestigious center for scholarly pursuits, Fullerton College also possesses some significant design features. Hi there, globetrotter. We know you're eager to get the most out of your vacation, so why not take a look at car rentals in Anaheim? Book through Orbitz and get your unforgettable adventure on the road today! Make a beeline out of John Wayne Airport as soon as you arrive by picking up a car from a nearby vendor. Some of the best outlets to book with are National Car Rental and Enterprise. They're close to the terminal, so you won't miss them. Arriving in the city? Alamo Rent A Car is situated just 2 miles from the heart of town at 1565 S Disneyland Dr, Ste 105. Another convenient outlet sitting just 2 miles from the center of the city is Enterprise at 231 W Katella Ave.
With at least 181 hotels in Anaheim, securing your perfect room will be a piece of cake. We will make the decision straightforward, so you'll be able to focus on your incredible adventure! If something a bit extravagant is what you're after, slip between the silky sheets at the Disney's Grand Californian Hotel and Spa (1600 S Disneyland Dr) or the Disneyland Hotel - On Disneyland Resort Property (1150 W Magic Way). 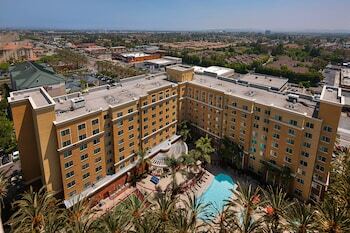 Otherwise, securing a room at an economical hotel such as the Del Sol Inn - Anaheim Resort (1604 S Harbor Blvd) and the Castle Inn and Suites (1734 S Harbor Blvd) will allow you to save your cash for wonderful Anaheim experiences. You'll be pleased to know that there are a couple of hotels within strolling distance of Disney California Adventure® Park if you're eager to stay nearby. The Disney's Paradise Pier Hotel-On Disneyland® Resort Property is just 0.3 miles away. If you'd prefer something else, check yourself into the Courtyard by Marriott Anaheim Theme Park Entrance, which is 0.3 miles away. After sitting down in a cramped seat for hours, you'll be relieved to hop off the plane and stretch out at John Wayne Airport (SNA). Situated 11 miles south of the downtown area, this is the main point of arrival for those traveling via air. Anaheim has plenty of things to keep you busy, but if you want to branch outwards, you're in luck! You've got globally celebrated attractions just a stone's throw from here! Huntington State Beach draws travelers from all nations. Newport Beach, only 16 miles from Anaheim, is a handy base when stopping by this unforgettable attraction. Feeling a bit forlorn because you need to cancel your journey? Well, don't worry — we're certainly not going to make matters worse by making you pay a fee.^ If you act quickly, your hotel and airline might not either.